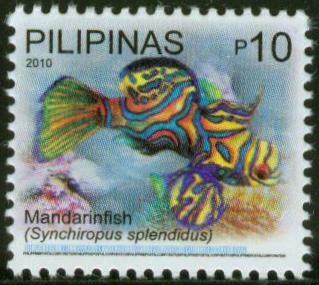 10p MANDARINFISH (SYNCHIROPUS SPLENDIDUS). The mandarinfish or mandarin dragonet (Synchiropus splendidus), is a small, brightly-colored member of the dragonet family, which is popular in the saltwater aquarium trade. The mandarinfish is native to the Pacific and was first described as Callionymus splendidus in 1927 by Albert William Herre, an American ichthyologist working in the Philippines. To date, S. splendidus is one of only two animal species known to have blue colouring because of cellular pigment. 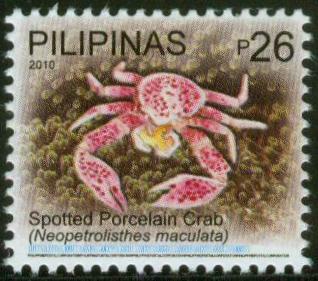 They are reef dwellers, preferring sheltered lagoons and inshore reefs. While they are slow-moving and fairly common within their range, they are not easily seen due to their bottom-feeding habit and their small size (reaching only about 6 cm). 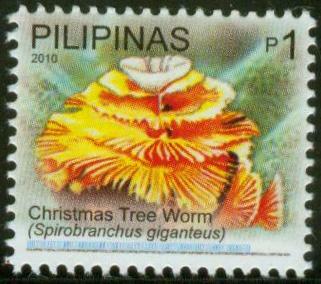 They feed primarily on small crustaceans and other invertebrates. (http://en.wikipedia.org/wiki/Mandarinfish).